As I write this intro, I'm just back from a couple of days at ELCAF. Kudos to organisers Nobrow for putting on such a fantastic showcase of the independent comics scene. The range of work on display was hugely impressive, and I returned home skint for the rest of the month but with some brilliant books, several by artists I've not read before. One of the opportunities such events offer is the chance to see the output of a single imprint grouped together. I enjoyed the chance to speak to the team from Avery Hill, whose current lineup is particularly strong, as well as some of those they have published, such as Simon Moreton and Rachael Smith. Drawn to the Breakdown Press table, I spent a fair while chatting to Grumbling Fur member and friend of tQ Alexander Tucker about comics and music. Look out for a review of his new book World In The Forcefield 1 in the near future. There was a very strong aesthetic to all the work on Breakdown’s table, and I found myself buying a copy of Lando’s Gardens of Glass and wishing I’d had a bigger bag with me. Erstwhile stalwarts of the small press scene Throwaway Press (of Dirty Rotten Comics fame) had some terrific work on display, and seeing Nobrow’s catalogue piled on tables served as a reminder of just how much care they take with the outside of their books as well as the contents (and by the way, they have some great releases just out and coming soon too). 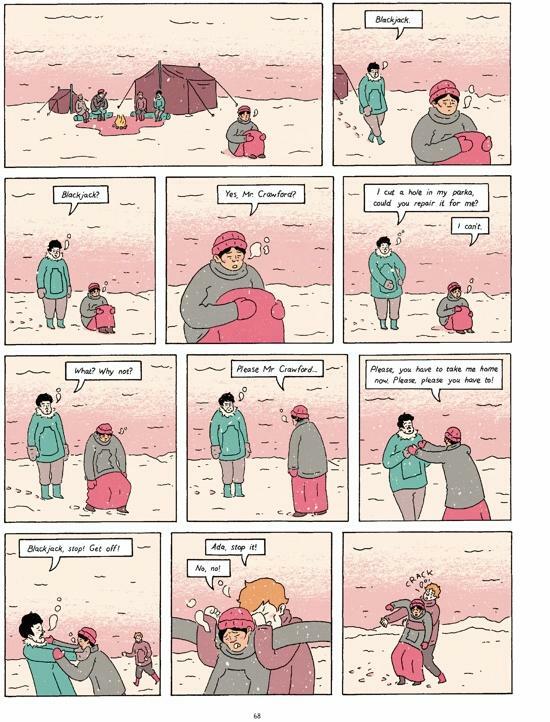 Permanently behatted Andy Oliver from Broken Frontier, whose recent anthology is reviewed below, was of course there. He’s also involved in Small Press Day 2016, an event taking place on 9th July in comic shops all over the country which looks well worth visiting if you get a chance. Finally, I briefly met Zainab Akhtar, who has just launched ShortBox, a curated collection of interesting comics that proved so popular that the first edition sold out in an hour. The UK scene is looking very healthy right now. 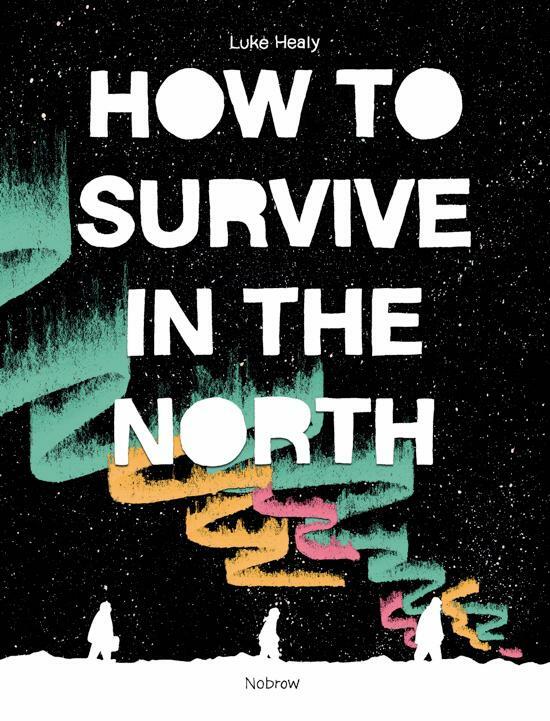 Luke Healy’s How To Survive In The North is an extremely accomplished debut graphic novel. Based on two related Artic expeditions, both of which were well documented at the time, it adds a contemporary fictional third strand. The expeditions were organised by Vilhjalmur Stefansson as an attempt to prove his theory of ‘the friendly Arctic’, his notion that as long as you knew how to get food and fuel from under the ice, it would be unproblematic to explore the area. The first expedition, in 1913, did not provide the confirmation he was looking for, although the polar bears seem to have found it easy enough to find food. The second, in 1921, is the tale of Ada Blackjack, an Inuk woman who accompanied the explorers as a seamstress to earn money for her tubercular son’s healthcare. The fictional strand set in 2013 concerns a disgraced college professor who starts to research Stefansson after discovering they had both occupied the same office. As noted above, It’s a good time to be a fan of UK small press comics. The Broken Frontier Small Press Yearbook 2016 is the brainchild of Andy Oliver, and fits into that category of both great and great value. A beautifully printed volume of over 80 pages, many in colour, it features some superb pieces. Organised around longer pieces from Broken Frontier’s list of ‘Six UK Small Press Creators to Watch in 2015’ - this is essentially their graduation show - it then follows up with 10 or so shorter pieces from more established artists. There's a consistently strong selection, with too many pieces to mention them all. Danny Noble’s Plain As The Nose On Your Face is brilliant, a ghost story wrapped up as a campfire tale and drawn in her instantly recognisable style. The chaotic layouts mixing and overlapping panels and unbordered drawings combined with her expressive faces work to create an engaging and very funny piece. 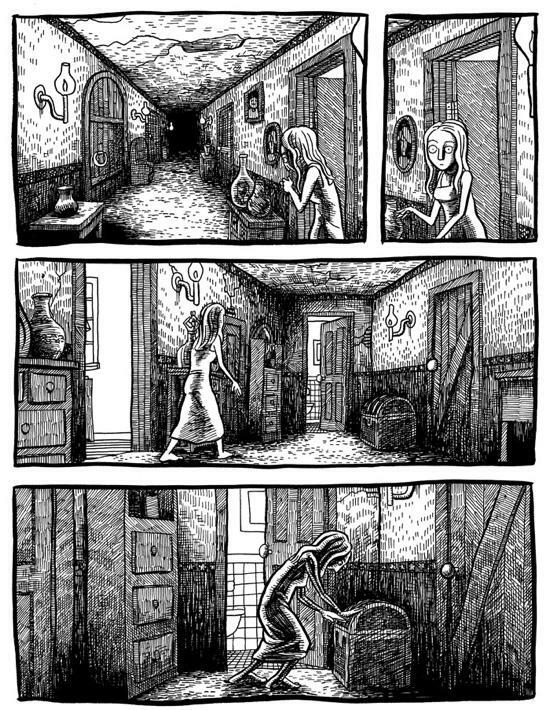 It’s followed by Rozi Hathaway’s Afloat, a strikingly beautiful wordless tale of a child’s loneliness and imagination. 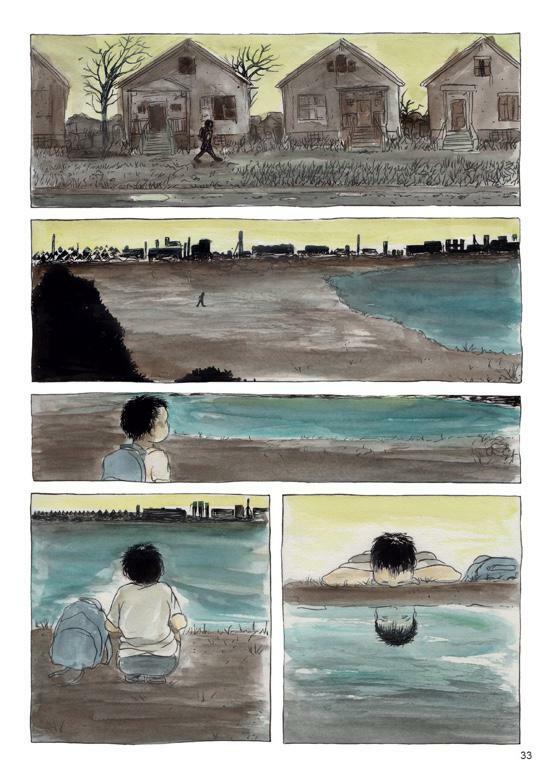 Her art is terrific here, with wide panels working to place the child in small and large spaces, but always alone, with stunning colouring, sombre except for the sea and the sky. 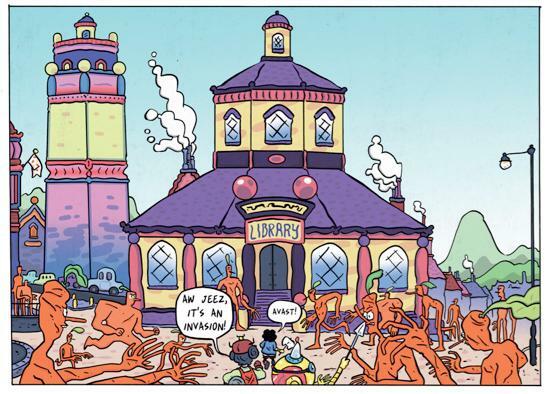 Adam Vian’s Court Of The Mapkeeper is next, in which much smaller panels and heavily stylised characters are used to tell the story of a feisty fortune teller. The second section of the book is also excellent, with a particularly funny Alex Potts strip amongst others. Irmina is a weighty book, in both form and theme. 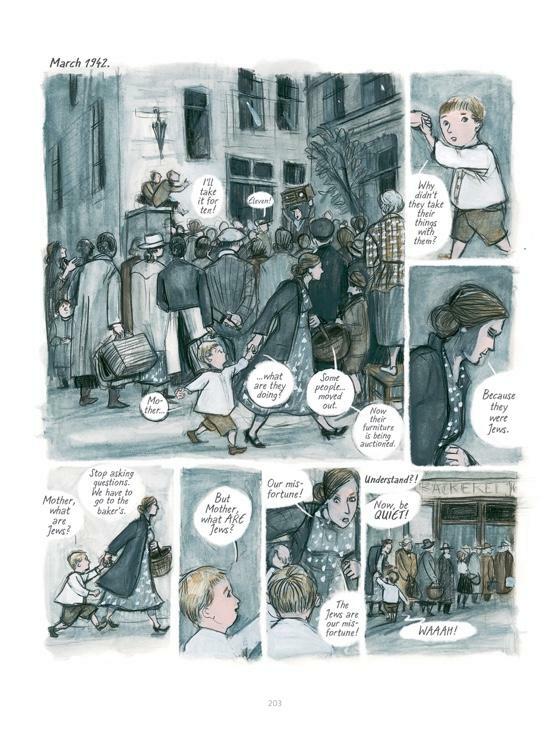 A beautiful hardcover up to SelfMadeHero’s usual high standards, it’s based on Barbara Yelin’s grandmother’s experiences living in Hitler’s Germany. Yelin’s introduction explains that she discovered a box of letters, and these left her wondering what turned her grandmother into someone who complicitly turned a blind eye to what was happening to the Jews. The book starts in 1934 as Irmina arrives in London to study. We only hear of Germany through the English media, usually provoking a defensive response, but she is much more interested in what’s happening where she is, particularly in her relationship with Howard, one of the first black students at Oxford. As they become close, however, she is forced to return home, and the book switches to Berlin. Now she works for a ministry in Berlin, where in contrast to her, most people are deeply patriotic and proud of Hitler. Her hopes of transfer back to London are gradually dashed, and having faced a constant financial struggle just to eat and stay warm, the lure of prosperity leads to marriage and a child. We see occasional glimpses of what is happening to the Jews when she ventures out of the apartment, but the holocaust is not addressed until Irmina’s young child starts asking questions. By now her heart is hardened against everyone, and her reply is to "Do what I do, Frieder, and look away”. Jessica Farm is Josh Simmon’s ambitiously long term project - beginning in January 2000, he’s produced a page a month and intends to spend a total of 50 years on it. What we have here is therefore only a small part of the story. Volume 1 was published in 2008 and is reissued here alongside the second part, which together take us to just under 200 pages. And what pages. Jessica Farm lives on a farm, in a deeply bizarre house, much larger on the inside than the exterior suggests, like House of Leaves. She lives with her menacing father, and also many others, including countless tiny people. One nervously watches over her closet, while another leads a band who perform in the shower and give concerts in the attic. Not everyone is small, however - at one point a sinister man drags her into a room full of mutilated babies until she escapes, and we also encounter Captain, who seems to exist solely for Jessica’s sexual gratification. This is all scene setting, however. When Jessica is attacked by a vicious monster and manages to escape, her grandparents send her on a mission, and the story heads in the direction of a fantasy quest, albeit a deeply transgressive, shockingly violent one. If Volume 1 is setup, Volume 2 is mostly a fight scene and chase, during which we learn that Jessica is the chosen one who will save the farm. The main battle is long enough that Simmons would have spent four years drawing it, densely packed pages full of hundreds of monsters drawn in his distinctive, slightly cartoony style. His shortest stories such as those in The Furry Trap often show fantastical worlds but without no explanation, just action. With longer pieces like House there’s much more detail but questions remain. Here, however, we are getting the chance to spend much more time in one of his worlds, and although there are few answers so far it does feel like they will come. These books are the sort you read very fast for the story, then again right away to slow down and savour the images. As ever, the interiors in particular captivate, darkly hatched and full of mysterious shadows. As you might expect for something produced over such a long time, however, there are some visual inconsistencies, with some of the pages of the fight being less well drawn. This is my first encounter with Kelly Kwang’s art, and it’s unlike anything I’ve seen before - it took me a couple of reads through to get my bearings on it. There’s a hugely distinctive, consistent aesthetic at play here. 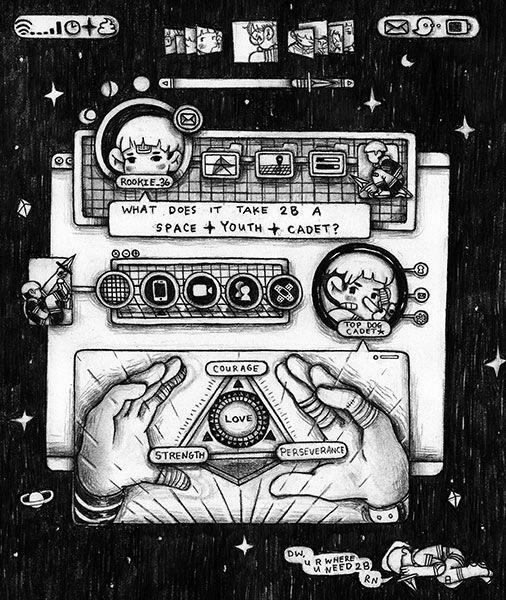 This is apparently part of an ongoing series featuring her Space Youth Cadets, and functions as a meditation on internet culture amongst other things. Many pages feature complex graphical user interfaces that bear some resemblance to Kai’s Power Tools, the famous set of Photoshop plugins from the 1990s, a world away from the clean, flat design favoured by the current generation of computing devices but much closer to those of games. Several pages bear more than a casual resemblance to the opening of an RPG where the player gets to customise the characteristics, appearance and accessories of their character before playing. There’s a cuteness to the images that is somewhat at odds with the numerous depictions of bladed weapons. Mostly in black and white, occasional hints of colour are to be found. Some pages are photographs of drawn images, prints, pins and fabric, making unusual use of 3D space and showing the breadth of Kwang’s expression of this aesthetic. Visually, Parsley Girl is fantastic. The psychedelic designs are a feast of quirk and colour and the storytelling is both inventive and cohesive. The world Swan has created is populated with a great variety of weird and wonderful creatures, everyone a new colour and shape, although the possessed carrot monsters are of course all orange. And sort of, carroty. It’s not really clear what the eponymous heroine’s place in this world is, she and her two ‘pals’ (housemates? Family? Lovers?) have super powers, but I’m not sure whether this is the exception or the norm in the world of Parsley Girl, or what she has to do with Parsley other than being green. I would love to see the author develop this more in future issues as the world is an engaging one and the characters likeable and funny. The pages are peppered with little visual action jokes which work without being distracting, some referencing tropes of adventure and super hero genres, others delightfully bizarre in their own right. Highlights include a full page hieroglyphic coda handily portraying the spell needed to beat the bad guys, a Shaun of the Deadesque sequence of suburban mayhem, and a tall multi-coloured couple choosing potatoes in the vegetable aisle. Having just complained in my last review of a lack of narrative, I’m not about to write a rave on a comic that has zero narrative, at least in the usual sense. With this latest and most official print incarnation of Gareth Hopkins’ ongoing abstract comics project of the last 8 years, you have the chance to really grapple with that question of the creation of tension and narrative drive in comics, beyond and in absence of not only dialogue, but any figurative visuals at all. 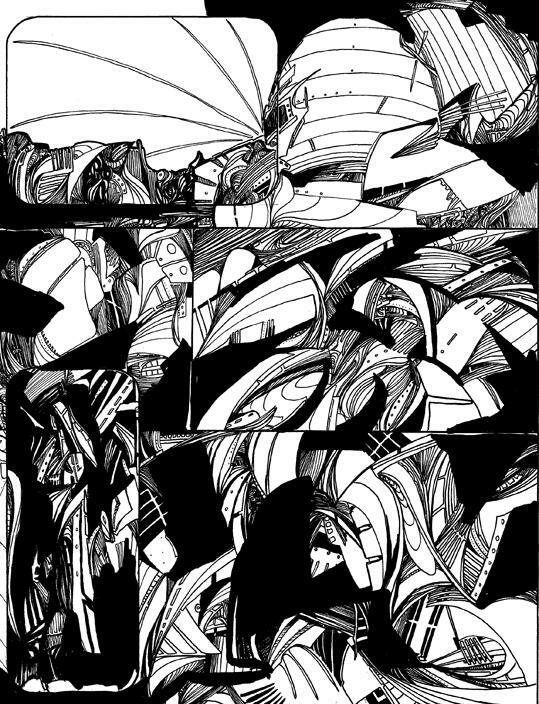 Unlike many abstract comic artists however, whose imagery is often more akin to modernist painting wrestled into a grid format, Hopkins structural inspiration for this work is firmly rooted in the tricks and conventions of more traditional graphic storytelling, specifically in British anthology comics that the artist loved as a child (and still loves, presumably). In places ghostly hints of figures and objects are discernible in the abstract masses of line and tone, an effect which I find both arresting and slightly disappointing, as if the origins have not been cleverly enough masked in that panel. 5,000 km Per Second is Manuele Fior’s first book to reach an English-speaking audience even though he has been creating graphic narratives for over a decade. 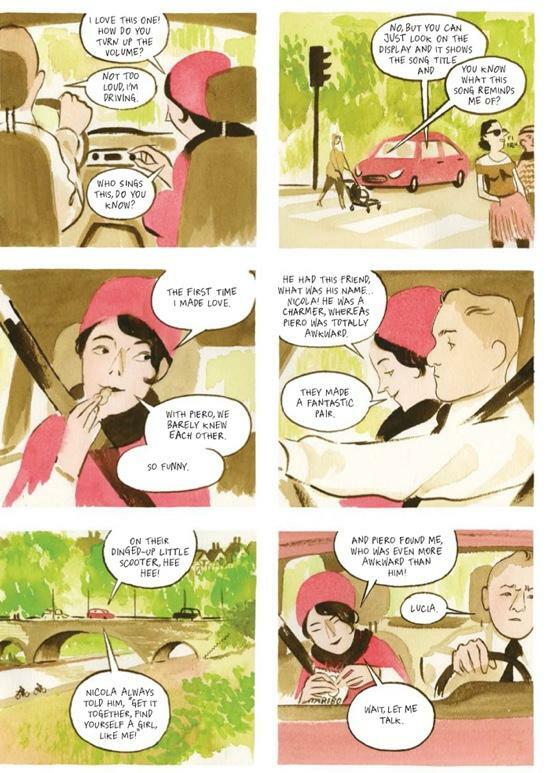 Winner of the prestigious Golden Wildcat at Angoulême for best graphic novel in 2011, 5,000 km Per Second tells the story of an almost romance between Piero and Lucia, two Italians living abroad in Egypt and Norway respectively. The book begins with their adolescent infatuations in Italy, but before any sparks are allowed to fly we skip ahead to the post break-up melancholy, and the way in which these characters accept or deny the past. Fior’s use of watercolour is a perfect choice of medium giving the characters a fluid and spontaneous sense of movement, while subtly depicting the emotional spectrum developed throughout the book. Youthful beginnings are painted in festive yellows, the heartaches of separation are painted in sickly blues and earth tones, the excitement of parenthood brings forth vibrant pinks and greens, and finally when the distant lovers reunite as middle-aged adults the art shifts into an emotional array of violet. Every brush stroke is an integral part of the storytelling, not only depicting Piero and Luica’s attitudes towards each other, but also representing their displacement. The core of the book is obviously the unrequited love story, but as Piero and Lucia reminisce and settle into their new lifestyles we discover how the meaning of home changes for them. Is home your place of birth or your place of residence? Does home travel with you like a piece of luggage, or is it something that gets left behind? Through Piero and Lucia’s story we learn that in a life often on the move, our definition of home can be as transient as our romances. Glen Baxter is almost completely bonkers. Why almost? 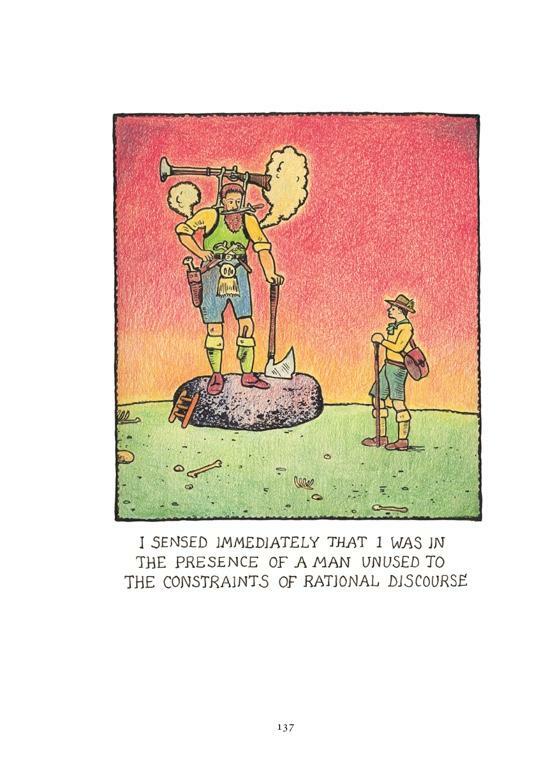 Because despite the absurdity of his cartoons his world is surprisingly logical. In order to sneak behind enemy lines why wouldn’t you retrofit a canoe with wheels and submerge it under water? His characters tend to take the road less travelled, or perhaps the road never travelled before, such as the Viking who invented the first yo-yo, but aren’t all visionaries seen as crackpots until their inventions meet our everyday needs? I believe that if I ever met Glen Baxter the experience would be much like one of his cartoons featuring an uncomfortable encounter between a boy and an overly equipped hunter. The caption reads, ‘I sensed immediately that I was in the presence of a man unused to the constraints of rational discourse.’ At first glance, the axe, knives, pistols, blunderbuss, and smelly armpits are enough to deter anyone from conversing with the imposing individual, but when you examine more closely, and discover that the man uses a tiny ladder to climb a rock no taller than the average person’s kneecap, one’s only defence is to act as casual as possible while eyeballing the quickest escape route.